NORWALK, Conn. – They say a leopard can’t change is spots, but no one ever said a mayor can’t change his mind. And that, apparently, is exactly what has happened. 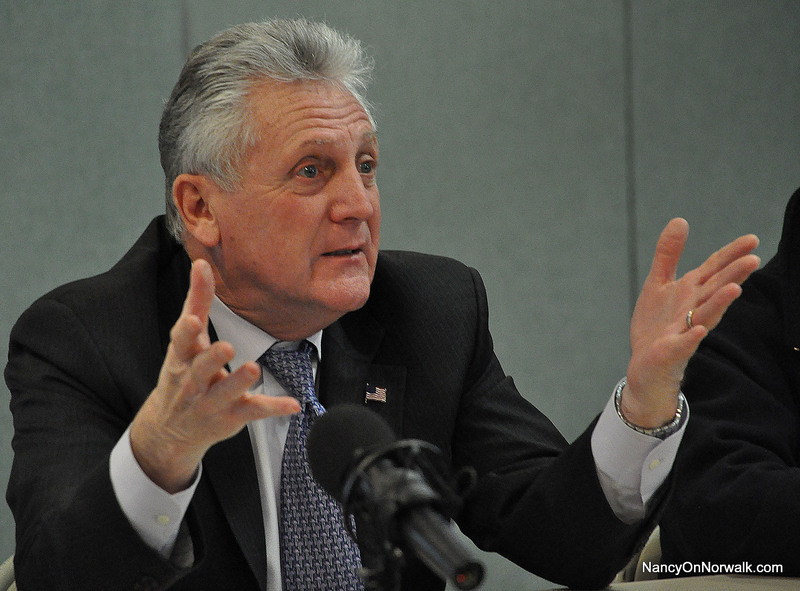 When Mayor Harry Rilling was candidate Harry Rilling in 2013, he said on more than one occasion that, while he wanted to get development in action at the various bombsites around the city, he was against the idea of a mall for the 95/7 property. While the mayor does have the bully pulpit, he has no role in the approval process. The report examines several factors, including new construction costs, financing, delivery time, vacant inventory, Merritt 7, and area competition. One factor to note, Class A office space in Norwalk currently rents at an average of $32 per square foot; Stamford commands slightly higher rents of $38 per square foot, while Greenwich commands significantly higher rents at $71 per square foot. CBRE’s report affirms that new construction costs today necessitate rents in the high-$40’s to mid-$60’s and involve a waiting period. The analysis of the commercial office market in the greater Norwalk area was requested as the Committee considers a proposed change to the Land Disposition Agreement (LDA) for the 95/7 parcel. The site is currently entitled for up to 1.1 million square feet of mixed-use development, with 600,000 square feet dedicated to office use. Given that the vacancy rate for Norwalk Class A space is currently 16.3%, with 734,000 square feet of inventory vacant, General Growth Properties (GGP) believes the development of a mixed-use project that includes office space is not viable in the near or intermediate-term. “I think the mall is going to bring increased tax revenue to the city and the most important thing is they’ll provide a lot of Norwalk residents with an opportunity for employment,” he said. Rilling was asked about what types of jobs will be available, as mall stores traditionally are not considered to be plums. And, he said, part-time and lower-paying positions that might attract less-skilled workers are important as well. Rilling said last week’s announcement that high-end retailer Nordstrom had agreed to become one of two or three anchor stores was good news for the city. As for the other anchors, Rilling said he expected stores of a similar level. The news about Nordstrom was met with excitement in South Norwalk, if the SoNo Buzz Facebook page is any indication. As of early Monday morning, a link to a story about the announcement had 349 likes and 51 overwhelmingly positive comments, and more than 100 shares. Rilling joins a bevy of politicians, including State Sen. Bob Duff, Reps Bruce Morris, Chris Perone and Fred Wilms, and Gov. Dannel Malloy in supporting the mall. Let’s hope this done deal works out for Norwalk. We’ll know in a decade or two. Thank you, Mayor Rilling! Everyone is allowed to change their mind with circumstances that change the dynamics presented. You’re a great Mayor and also thankful for the minimal tax increase. I disagree with Rilling on taxes and union give aways quite often, but in this case he is 100% correct. There is no demand for more office space when the vacancy rate is 16% in Norwalk and the surrounding area. Also, shame on you who belittle the retail wages, you may not need it because you retired on a fat public union pension, but there are young people and low-income people that need whatever job they can get. If you don’t want them to have these jobs move to Florida or some other state. development market long before taking office. But that’s another story. Hiring a development officer from Newtown tells us all we need to know about interest in corporate development. to Bill: Its unclear whether the new low wage jobs available to City residents from the mall will just offset those lost by City residents from businesses forced out by the mall’s 75 to 100 new stores. The number of “new jobs” claimed by the developers is actually greater than the number of unemployed in the City. And since the regional mall will draw from other areas in CT jobs here will simply offset jobs lost elsewhere. Furthermore, the traffic conequences from a million new visitors claimed by the developers each month will very likely dissuade some businessmen from doing business here. So its premature to give huzzah’s to “jobs creation” from the mall. We’ll have to wait and see the effects of a million new visitors each month – more than 1000 autos per hour – on local business and community. It will surely be “interesting” depending where one lives in Norwalk. Finally, whther the Mayor supports or doesn’t support the mall has no real bearing. Its our Common Council and other City agencies that make that decision. Courtesy of our weak Mayor strong Council local governance. @Piberman, I usually agree with you, but on this one you are wrong. The mall will enhance the town. I cannot think of any businesses it will displace other than an apparel consignment shop on Washington street, and who knows, maybe more women will come from outside of Norwalk and buy at that consignment shop once they see that it even exists. Don’t be so quick to shoot down what the free market wants on this one; it is what will save us in the end. Mr. Berman has been criticizing all city officials including the mayor ad nauseum by saying they are “indifferent” to traffic concerns, without a shred of evidence to support that claim, then claims in his last comment that the mayor’s opinion doesn’t really matter anyway. I see. Despite Mr. Berman’s repeated untruthful claims that a traffic study will not be conducted, the truth is it will be, and is required. And now he claims, in a comment in the March 1st NON mall article (again without a shred of evidence provided), that the applicant “sees only opportunity, not the lifestyle and economic consequences on City residents.” It is unlikely Mr. Berman has ever met the applicant’s staff, but of course he knows for sure they don’t care about city residents at all, and he knows for sure that the convenient shopping, increased grand list and property taxes, and the 2,800 jobs will have “no lifestyle and economic consequences for City residents”. Those are his words. The truth is, it is certainly in the best interest of the applicant and their paying tenants to make sure their project succeeds and does not end up in traffic gridlock, and based on their comments and actions to date (as has been reported on the record) they are willing to invest millions to make sure that happens. We do know there will eventually be some kind of massive development on this prime site generating traffic, no matter what it is. If it is office, it will add weekday uni-directional peak activity (tidal flow) at morning and afternoon rush hours just as city residents are also driving to and from work. Housing has similar peaks, with less volume but still cyclical with a morning outflow and evening inflow,, timed right at busy rush hours. Retail also has peak hours but it mostly happens outside traditional rush hours, such as late morning/early afternoon, post-rush hour evening, and on Saturday and Sunday afternoons. Retail employees often arrive after rush hour in the morning and leave after rush hour in the evening. I have been critical of the city’s lack of long-range planning concerning the CT Ave big box expansion in the past because the overall cumulative effects of the regional traffic they generated (along the 2-mile long corridor) were ignored over decades, as one project after another was approved, resulting in the need for taxpayers to now step in and pay for road improvements to expand capacity long after the developers made their profits and moved on. At the 95/7 site at West Ave, the street has already been re-designed with a huge new project in mind at the 95/7 site, and further changes will be made by the applicant as they have promised as has been reported in many articles. Like any development project there are positives and negatives. But I find it “curious” that there’s not been much “interest” on the consequences to the lower income minority residents who make up much of the downtown area from the enormous traffic congestion spawned by one million estiamted new visitors monthly in terms of air pollution, noise, difficulty of entry/exit, etc. If the mall was proposed for one of our middle class areas the protests would rise to the heavens. Maybe the downtown folks feel there is no one to protest to. But it is there community that bears the brunt of the traffic “assault” that in turn benefits mostly out of town shoppers and store owners and mall investors. Their community is going to be turned upside down. As I’ve written elsewhere the net local jobs gain will likely be very modest and perhaps unchanged. Few downtown low income minority residents will be shopping at an upscale mall. When Silver Mine residents protested loudly about B-J’s they cited traffic concerns. Now with a million visitors espected monthly (Aquarium gets only 500,000 yearly) there are no concerns about expected traffic effects on the local community – mostly lower income minority residents. Nor any traffic study is help guide int the initial discussions. Either local downtown residents are unconcerned about the traffic deluge or they know in advance what to expect from City Hall. The issue here is not that any 95/7 project will not bring in traffic but that at the outset there rightly ought to be some sense for the community about the particulars of the traffic increasae. Especially the effects of one million new visitors monthly. That City officials haven’t at least required a preliminary traffic study suggets to me that they are confident that downtown residents will not object to a million new vistiors radically changing their community. I suspect they fully understand there’s no one to talk to . Not Mayor Rilling. Or any body else. For the environmentalists the math from pollution from 1 million new visitors arriviing by auto each month becomes qutie intersting . Plus the associated sewage, refuse, water and electric usage, etc. But as long as the pollution stays downtown why worry. Its not our neighborhood. Its downtown and those folks have no choice about what happens to their environment. One would have hoped that Mayor Rilling given his close association with the downtown communities would have asked for a preliminary traffic study to undersatnd the consequences of traffic congestion and associated pollution affecting the downtown communities. One would have hoped that “someone” would have asked t he relevant questions and perhaps have had the courage (yes courage) to perhaps ask the developers to modify their plans should the trffic and pollution studies suggesdted unacceptable consequences. But this is Norwalk, one City, where some people are more equal than others.